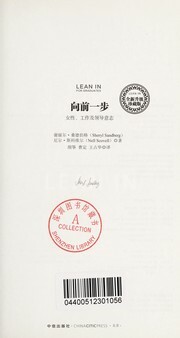 2 editions of Lean In found in the catalog. Add another edition? Are you sure you want to remove Lean In from your list? Published 2013 by Knopf in New York . Thirty years after women became 50 percent of the college graduates in the United States, men still hold the vast majority of leadership positions in government and industry. This means that women's voices are still not heard equally in the decisions that most affect our lives. 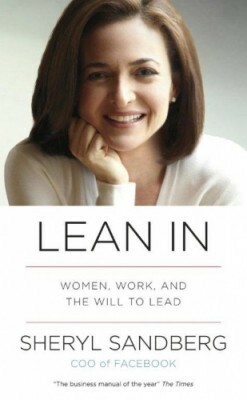 In Lean In, Sheryl Sandberg examines why women's progress in achieving leadership roles has stalled, explains the root causes, and offers compelling, commonsense solutions that can empower women to achieve their full potential. Sandberg is the chief operating officer of Facebook and is ranked on Fortune's list of the 50 Most Powerful Women in Business and as one of Time's 100 Most Influential People in the World. In 2010, she gave an electrifying TEDTalk in which she described how women unintentionally hold themselves back in their careers. Her talk, which became a phenomenon and has been viewed more than two million times, encouraged women to "sit at the table," seek challenges, take risks, and pursue their goals with gusto. In Lean In, Sandberg digs deeper into these issues, combining personal anecdotes, hard data, and compelling research to cut through the layers of ambiguity and bias surrounding the lives and choices of working women. She recounts her own decisions, mistakes, and daily struggles to make the right choices for herself, her career, and her family. She provides practical advice on negotiation techniques, mentorship, and building a satisfying career, urging women to set boundaries and to abandon the myth of "having it all." She describes specific steps women can take to combine professional achievement with personal fulfillment and demonstrates how men can benefit by supporting women in the workplace and at home. Written with both humor and wisdom, Sandberg's book is an inspiring call to action and a blueprint for individual growth. Lean In is destined to change the conversation from what women can't do to what they can. - Publisher. The leadership ambition gap : what would you do if you weren't afraid? September 16, 2013 Edited by Bryan Tyson Edited without comment. April 2, 2013 Edited by Kate Adler Edited without comment. April 2, 2013 Created by Kate Adler Added new book.